Cervical scoliosis describes an abnormal side-to-side spinal curvature in the neck. Although rare, scoliosis in the neck can present a difficult to treat case profile for physicians. Most patients who demonstrate cervical scoliotic curvature do so as part of a larger cervicothoracic or cervicothoracolumbar curve that runs from the lower or middle back to the neck. Statistically, few cases of exclusively cervical side-to-side spinal curvature exist. Cervical spinal scoliosis comes in two varieties, including early onset and adult forms. Early onset scoliosis describes curvatures that form congenitally, during infancy or in childhood or adolescence, while adult forms are developed through injury or spinal deterioration later in life. We only receive a few letters regarding cervical spine scoliosis each month, but realize just how difficult it is to find quality information about such an uncommon subject. Therefore, we have dedicated this essay to helping patients who are affected by side-to-side curvatures in the neck by providing a comprehensive view of the condition, including the causes, the potential effects and the typical treatment options. Atypical side-to-side curvatures found only in the neck fit into 2 distinct varieties, as detailed above. Most cervical spinal scoliosis cases are considered adult onset cases and are linked to trauma, degeneration and general vertebral aging. Only a small number of cases of scoliosis in the neck are formed during the early years of life. Meanwhile, larger scale cervicothoracic or cervicothoracolumbar curves are more likely to be linked to early onset than to adult onset circumstances. These larger scale curvatures are not necessarily worse, but certainly do affect a larger portion of the spine. Most cases of early onset scoliosis, including congenital, infantile and adolescent varieties are idiopathic in nature. Scientists have identified positive causes and contributors in some patient profiles, but most patients develop their abnormal curvatures for unknown reasons. Meanwhile, adult onset cases are virtually always attributable to known instances of neck injury or spinal aging. All of the usual degenerative processes have the potential to change the front-to-back or side-to-side curvature of the spine over time. These include degenerative disc disease, intervertebral herniation, spinal osteoarthritis, ligamentous issues and spinal joint deterioration. Since the middle to lower neck regions are noted as being highly susceptible to these degenerative changes, as well as being disposed towards injury, it is no surprise that most cases of scoliosis exclusively located in the neck are of the adult variety. Since the head will be held off center, the muscles will endure an uneven load, potentially causing chronic strain or a muscular imbalance condition. Cervical nerve roots might become compressed in between vertebrae that are much closer together unilaterally than is normal. This change in vertebral alignment narrows the neuroforaminal spaces and might even compromise the integrity of the central spinal canal in extreme cases. Resulting symptoms might stem from pinched nerves and/or cervical spinal stenosis. Cervical scoliosis might predispose affected persons towards increased risk of neck injury, such as whiplash, depending on the particulars of the trauma imposed on the neck region. Cervicothoracic and cervicothoracolumbar curvatures affect much larger areas of the backbone, yet are not statistically more problematic than simple cervical-only spinal scoliosis. Each case must be evaluated individually, since larger scale curvatures fit different profiles and each tends to dispose the patient towards different symptomology. For example, multiple curvatures, also called S curvatures, tend to balance themselves out, although this is not a rule by any means. In essence, when the spine is multiply curved, each curve helps to balance the other. In larger C-shaped single curvatures, the chances of significant symptoms increase greatly, although these circumstances are certainly not commonplace. Treatment for scoliosis in the neck ranges greatly, depending on many factors and presentations. Each case must be evaluated by an expert and then recommendations made on treatment based on age of onset, degree of curvature, type of curvature demonstrated, symptomatic expression and prognosis for the future. Early onset scoliosis is generally treated conservatively using bracing. This technique involves utilizing special orthotics that are custom tailored to each patient. For large scale multi-region curvatures, this is the most effective therapy towards halting the progression of the curvature as the child grows, therefore minimizing its potential effects for pain and for internal organ compression. 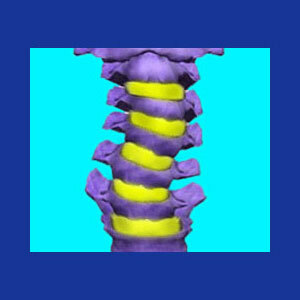 However, scoliosis residing only in the neck presents a much more difficult case profile to brace effectively. Modern brace designs are moderately effective for reducing the progression of rare cervical-only scoliosis, but some cases still progress, despite the most aggressive bracing attempts. Additional treatments used in some cases of early onset scoliosis include postural and physical therapy and the possibility for surgical intervention in the worst cases of atypical curvature. For adult onset cervical spinal scoliosis, treatment is generally conservative in nature and utilizes physical therapy, pain management and other noninvasive techniques. A brace might be utilized to provide muscular support, but will rarely demonstrate efficacy for halting possible progression of the vertebral changes that are enacting the curvature. Surgical intervention for adult cervical scoliosis usually entails spondylodesis surgery to fuse affected vertebrae, although in some instances, cervical-only scoliosis can be resolved by treating the underlying structural contributors to the causative mechanism. These specialized techniques might address disc or bone problems in one or more vertebral levels in an effort to bring the spine back into neutral balance. Larger scale, multi-region curves are usually surgically managed using the most invasive and risky types of hardware-assisted spinal fusion. These operations should be reserved only for the most symptomatic and extreme examples of pathological side-to-side curvatures, since they have a high rate of failure, often disappoint in reducing pain and can accelerate negative degenerative changes throughout the backbone. For more information on the diagnosis or treatment of cervical and combination cervical spinal scoliosis conditions, please consult with a qualified orthopedist and neurologist.